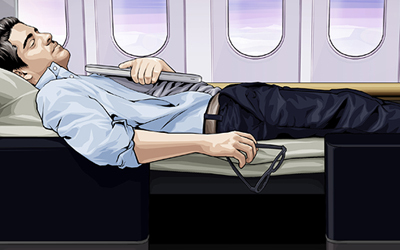 When booking business class flights, a lot of money does not have to be spent in order to travel in style. There are various places that offer cheap business class flights. These offers can be found on the web or in travel agents. A few helpful tips and quick searches can lead to some amazing deals on business class flights being discovered. These business class flights are offered at cheapest possible price, without the luxury of business class being forfeited. Business class flights should be looked for as early as possible. This is so that flights can be booked as soon as they are found, and will often result in the prices of the business class flights being a lot cheaper. The closer the bookings are made to the departure date, especially those booked at last minute, tend to become unnecessarily expensive. Before searching for and booking cheap business class flights, it is also advised to check the popular times of the year that the destination of your choice is visited. In these popular times, the prices of the business class flights will be much higher. Flights that are made at times of the year that see less business class travellers depart for your destination, will be far cheaper. As well as this method of securing cheaper business class flights, a lot of airlines will offer loyalty bonuses for regular customers. If possible, it is best to stick to one airline or company and build up rewards with them. These companies and airlines will want returning customers and so offer rewards to keep the same people using their services. By maintaining loyalty, this will often lead to upgrades and even discounts. This means that business class flights are offered at much lower prices. Loyalty rewards are beneficial to both the airlines and business class travellers so should be taken full advantage of. Another way of obtaining cheap business class flights is to have a definite route and destination planned out before booking for business class flights. Avoiding any changes in the plans for travel, will mean that flights are booked earlier and can be far cheaper. Changes are often done last minute and result in business class flights becoming a lot more expensive – in some cases even extra expenses can be added on to the bookings. Although mentioned earlier that booking in advance is desired, to ensure the business class flights are cheaper. There are many places online that will offer last minute deals. Simple searches online will lead to many deal comparison websites competing to offer the cheapest business class flights to the customer. Speaking to your travel agent about cheap business class flights can also led to fantastic deals and discounts for business class flights being discovered. Travel agents are there to get you the best package and cheapest business class flights available. These are done without sacrificing any of the benefits of business class flights. Booking in advance, and travelling to a county in an off-peak time, will also help when looking online and speaking to travel agents about deals available. All these tips should be applied to gain the best business class flights, at the cheapest price available ensuring a less stressful business class travel.